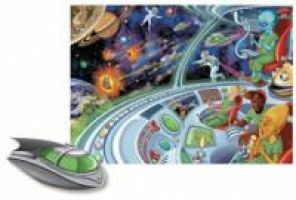 The Space Ship Glow Puzzle depicts an amazing space scene. Join the aliens in their flying saucer as they watch the asteroid shower from the best seat in the house - somewhere up above the Earth's atmosphere! Once it's put together, try turning out the lights for a really cool light show from the glow-in-the-dark accents; for an even brighter glow, try shining a flashlight directly on the accent for a little while before 'lights out'! 150 pieces - enough for hours of enjoyment! Completed puzzle size - 18" x 26 3/4"